An afternoon tea in the garden, how very English of me. A belated Christmas gift for my brothers girlfriend, a wonderful setting with perfect weather and the garden looking rather good too. The afternoon tea menu featured a new bake for me of choux pastry to make the Violet Eclairs - which incidentally were divine. 11-17 August is afternoon tea week, so why not join in. I really enjoy baking and putting everything together to host an afternoon tea. But I am aware not everyone has the time or feels happy baking, you can still host your own afternoon tea by buying your cakes and bakes - create your own afternoon tea menu. 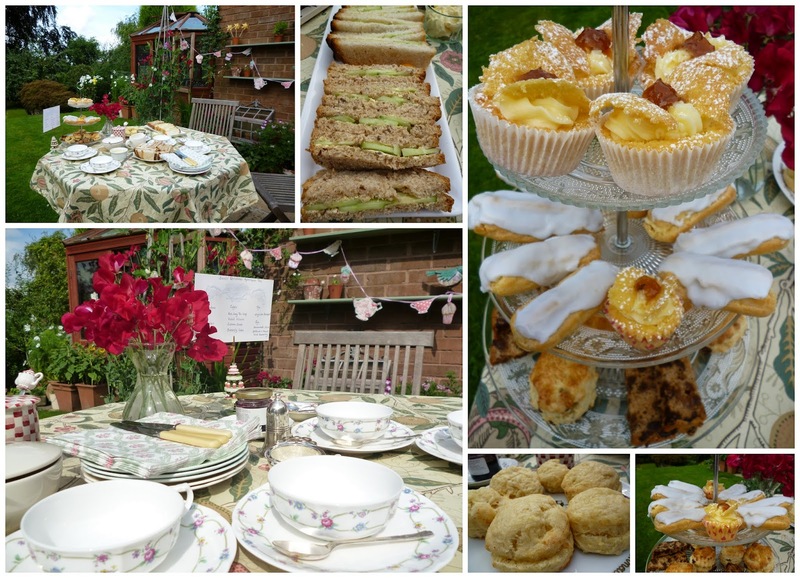 There were a few cheats with my garden afternoon tea, I am not sure if you have spotted them. I did not have any loose tea so used tea bags! Also on this occasion I did not want to waste the crusts so kept them on the sandwiches. I love the idea of Afternoon Tea Week. I wonder if I could put together a child-friendly version for my two!? It all looks so delicious! Afternoon tea is one of my favourite things, especially in a garden! It looks fantastic, and a great idea!